Congresswoman Norton signs bill to legalize marijuana use in federally assisted housing. 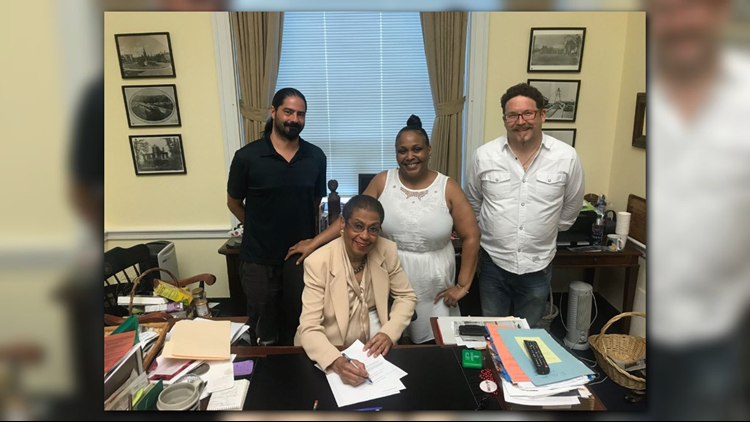 WASHINGTON -- D.C. Congresswoman Eleanor Holmes Norton introduced a bill Tuesday morning to permit the use of marijuana for federally assisted housing where it is already legal, for medical or recreational purposes. Norton named the bill the "Sondra Battle Cannabis Fair Use Act" after Sondra Battle, a D.C. resident who lives in Section 8 housing and is prescribed cannabis to treat her fibromyalgia. Battle signed the bill with Norton in support. Currently, using marijuana, even for medical reasons, is prohibited from being admitted to federally-assisted housing. Norton’s bill would make it illegal for a person to be denied federally-assisted housing for the use of marijuana in jurisdictions where medical or recreational marijuana has been legalized. Under Norton’s bill, smoking marijuana would be treated the same as smoking tobacco in federally-assisted housing.